On one occasion we came very near losing our horses and mules. The night after we had passed San Miguelito, Pedro woke us hop, telling us in a whisper that jaguars were round our camp. We could hear the horses stamping and snorting, but could not see the "tigers" (as they are generally called in South America). Bang! went Pedro's rifle, and with a fearful howl a black panther bounded nearly into the fire in his death-struggle. Another shot ended his agony. Click to enlarge Shortly after Pedro and I fired again, having sighted two other brutes. Both of us hit our target, for the reports were followed by a deafening roaring, blended with the cracking and breaking of branches, as if a herd of elephants were rushing past. Before the row ended another sound reached our ears which we did not like at all. Our horses had broken loose and stampeded! Knowing that they would be lost altogether if we did not catch them at once, I put two fingers in my mouth and whistled in a peculiar fashion. It was a signal I had taught my mare Pepita, and I thanked my stars when she came galloping back in answer to it, snorting and shivering with fear. 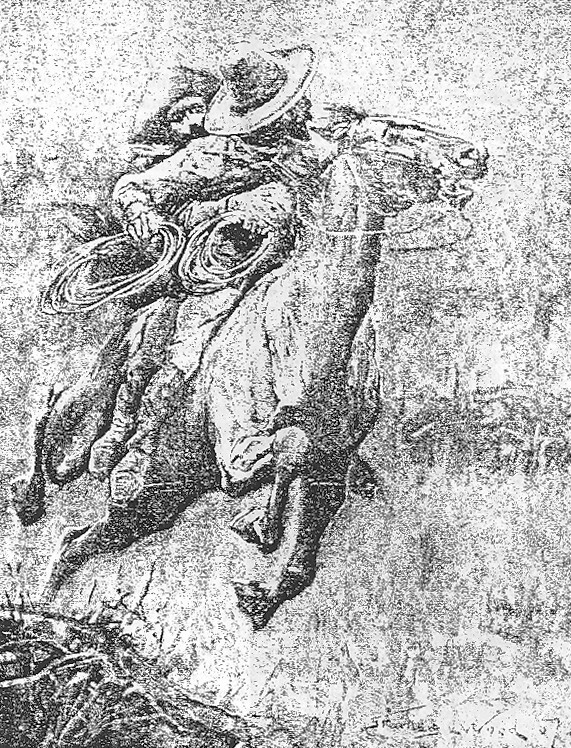 By this time Pedro had the lassoes ready, and, with the Mexican and myself both mounted upon her, my gallant Pepita went off at a headlong gallop after the others. And now I crave to be permitted a few lines in just praise of my noble mare, which carried me faithfully and well during my long, long ride. She was a half-breed between a "bronco" and a pure Spanish thoroughbred, stood about fourteen and a half hands, was as swift as an arrow, surefooted as a goat, and almost indefatigable. She was a beauty, endowed with great intelligence, and of a very amiable and docile character. She twice saved my life, and, as I have said, carried me all the way from Mexico to the Argentine. The night was very dark, and our road in pursuit of the fugitives carried us through forest, over stony hills, and across valleys strewn with huge boulders of rock. I left Pepita to her own guidance, and before twenty minutes elapsed, despite her heavy load, she closed up with the fugitives. A few minutes later they were lassoed and secured once more. When we reached camp again we were glad to find that José had breakfast ready for us, and had also nearly completed skinning the first tiger; the other two we found at daylight. One measured nearly six feet in length, but the other was much smaller. We journeyed for some time without any exciting incident, crossing the Republics of Costa Rica, Panama, and Colombia. We had fair sport, shooting a number of alligators and pumas, a couple of bears, and some jaguars: these last animals were a source of continual trouble to us. There were large numbers of peccaries (small wild pigs) in the woods, who waged continual war with the jaguars. One morning I went on guard at 2 a.m., and soon afterwards noticed that the smaller animals in the surrounding forest were peculiarly restless. I kept a sharp look-out, but could see nothing, and finally came to the conclusion that our camp fire was the cause of it. Suddenly I heard a grunting and cracking of branches, and without warning five deer galloped over the small opening in which our camp stood. Shortly afterwards a large drove of pigs followed in their wake, heedless of the fire, and scattering the burning embers right and left. The last of them had not yet vanished into the woods opposite when, quick as lightning, another animal silently bounded past us - an immense "tiger." Of course, both my companions were wide awake by this time and on the alert, but the light was so very uncertain, and everything passed us so quickly, that none of us fired. Suddenly we heard a pig squeal. A howl and much grunting followed, so that we knew the tiger had overtaken his prey. As the noise did not cease or recede from us, Pedro and I snatched up our rifles and made for the spot. Coming nearer the battleground, we could hear the peccaries snapping and gnashing their teeth, and accordingly took good care not to attract their attention. Emerging into a small open space, we saw about forty of the infuriated animals struggling under a tree, some of them jumping up from time to time at the jaguar, who had mounted to the lowest branch, carrying the slain pig with him. We watched them for a while and then, as soon as we had light enough, took a careful aim and sent the tiger our greetings. With an echoing roar he fell down amongst the pigs, who instantly closed in on him. Fearing they would spoil the skin entirely, we rushed out, but the next moment we had to fly for our lives and hurriedly climb the nearest tree, for no sooner did the infuriated animals catch sight of us than they charged. The first three toppled over to a bullet apiece, but this in no way stayed the others. We had only just time enough to swing ourselves up to a branch before the rest were upon us, and, much against our will, we had to shoot no fewer than one-and-thirty of the herd before the others raised the siege. When we were able to return to the tree whence the tiger had fallen we were astonished at the sight. Although they had only had about a minute in which to attack their fallen foe, the pigs had literally torn him to shreds. The incident taught us a lesson in peccary ferocity which we never forgot. We shouldered two young pigs and departed. Already hundreds of "zopilotes," the carrion birds of South America, had settled on the surrounding trees, waiting for our departure ere beginning upon the remainder. Two days later, just at dark, our camp was visited by a native hunter. His features and everything about him seemed to be dried up, but he looked very business-like, and proved to be a very good fellow. He was homeward bound, his mule loaded with skins of every description, and he stayed with us four days, giving us many valuable hints. What I appreciated most was that he showed us a liana which, in time of need, would supply us with fresh, cool water when cut, and a tree yielding, under the same treatment, a white, creamy substance which we had only to mix with a little water in order to get a liquid of just the same taste and appearance as unsweetened condensed milk. Now, at least, we had not to drink our coffee always black, and as these trees - "palo de leche" (milk tree) he called them - were to be found all along our route, we should never run short of milk. I was so pleased with this discovery that I presented the old hunter with half a bottle of rare old rum, to which he was not averse. Amongst his skins he had that of a black bear, measuring about eight feet by two and a half; he got it in the mountains and had a very fierce struggle with him, he told us. We ourselves longed to make the acquaintance of game like this; so, after the Indian had left us, we started into the Andes. I took Pedro with me for, although José was an excellent companion, I liked Pedro better. The first day we bagged an "ai-ai" (sloth) and a deer, but on the second day, late in the afternoon, we found the traces of a bear. These led us, after much toil, to the mouth of a cave, the entrance to which was strewn with bones. As it was rapidly getting dark, we mounted a tree about forty yards away and made ourselves at home on a big branch, fastening Pedro's lasso - he never left camp without it - round our bodies and the trunk of the tree. As may easily be imagined, our position was not at all comfortable, and our limbs were very stiff by dawn. The sun was not yet up when we saw something stir in the shrubs near the cave entrance, and Pedro instantly fired. With a pitiful wailing cry a young bear rolled over with his spine broken. The next moment the old bear came tumbling out of the cave and, going to the little one, licked it all over, turning it round and round. We both fired at once, but either the bear moved or the light was bad, for our shots did not prove fatal. Uttering an angry howl she wheeled round and, seeing us, hesitated not a second, but charged at full trot. My next two shots hit her full in the breast, but still she came on, until a bullet from Pedro struck her head and brought her down in a heap. Pedro commenced skinning her while I went over to the little one, who was still moaning painfully, to give it the coup de grâce. Before I reached it, however, I heard the cracking of wood, accompanied by a deep, angry growl. Next moment a great male bear, standing at least seven feet high, broke out of the woods behind my companion, and only a few yards distant from him. Of course, I had my rifle up at once, but could make no use of it before the bear reached Pedro, as his body was between me and the beast. Pedro had been careless enough to leave his rifle on the other side of the dead bear; he vaulted over her at once, but it was too late. Before he could secure it the infuriated male was upon him and had dealt him a tremendous blow on the head, which felled him to the ground. I gave a shout, and at the same instant fired two shots to draw the animal's attention from my companion. In this I succeeded, for no sooner had the bear noticed my presence than he made for me. My next shot struck his head but, to my horror, when I pulled the trigger again, my rifle remained silent - the magazine was empty, and the maddened bear not more than ten yards away! Drawing my Colt and my heavy hunting knife I was preparing for a desperate and well-nigh hopeless fight, when I happy thought struck me. Quick as a flash I seized the young bear, which was still moaning, by his hind legs, and swung him into the path of his enraged parent. Fortunately my ruse succeeded. The bear halted by the youngster, turning him over and over inquiringly. This was my chance. Slipping four cartridges into the magazine, I was ready for action again. Now relieved of all fear for my life, I took careful aim and pulled the trigger. The bear collapsed as if struck by lightning, and I hurried on to look at poor Pedro. I found him unconscious, but beyond a deep gash in his scalp I could see no other injuries, and soon brought him to. After I had dressed his wound I fell to skinning the two bears, while my companion soon had a fire blazing. He suffered a good deal of pain, but we managed to eat nearly the whole of the young bear at breakfast. It took us just upon two days to reach our camp. Once upon the march again we passed Timana and, following an old mule-track, crossed the eastern Cordillera. On descending, the whole aspect of the country changed. Whereas before we had mountains on every side, and in the valley of the Rio Magdalene every kind of tropical vegetation, as well as game and birds, now our eyes travelled over miles and miles of monotonous grasslands - the "Llanos de Caguan." The heat in these llanos was terrible in the daytime, but at night it was very cold. The tent was always drenched with the heavy dew which fell after sunset, and our experiences were so unpleasant that we were sorely tempted to retrace our steps. This longing, however, we threw off, and pushed on by easy stages over the level plains. We took our course along the Rio Pagoya, so as not to be short of water, and about a month after we had left the valley of the Magdalena we saw the lights of a small place on our right. It was San Romao, on the Rio Ica, and here we were told that the frontier of Peru was only distant a few hours' ride. Before we entered the "Land of the Incas," however, I came very near to being roasted. It happened as follows. We had to ride some miles up-river in order to ford the Ica, and I espied some distance off a herd of animals I had not seen before. It was very hot, and neither Pedro nor José was eager to accompany me, so I told them to ford the river and wait for me on the other side. Then I went off alone. The animals were very shy and moved away, keeping a distance of about six hundred yards between us. My pursuit carried me out farther and farther into the endless plain, until my quarry suddenly disappeared. At first I thought of turning back, but a moment afterwards I saw them again. A deep "baranca" separated us, at least four yards in breadth. My gallant Pepita climbed across with some difficulty, and as I fancied the animals ahead showed signs of distress I pressed on with renewed eagerness. Presently I saw them toss up their heads and gallop off to the right. Having had no eyes for anything else but my quarry I did not notice the agitation of my horse, or that the atmosphere was getting hotter and hotter and intensely oppressive, so that I was considerably alarmed when I suddenly perceived a cloud of black smoke in front of me. I smelt fire, while a dull, roaring sound struck my ears, growing louder every second. In an instant the horrible truth flashed across my mind - the plains were on fire! A fierce wind had sprung up, driving the fire forward with tremendous velocity, and I was in deadly peril. Forthwith I turned my mare and we raced back, but soon the heat and smoke became almost unbearable - the fire was evidently gaining on us. On and on we flew, the wind rising to a gale and driving the flames before it with a roar like the thunder of surf on a rocky coast. Presently I remembered the baranca; it was a big jump for a fresh horse, but for a tired animal like mine it promised disaster. Still Pepita raced on, her flanks heaving with her tremendous exertions. She was losing in strength with every bound, and now the fire was not more than fifty yards behind us! Thank Heaven! the baranca yawned ahead of us, not more than ten yards away. It was neck or nothing now, so for the first and only time I pressed my spurs into her flanks. The gallant little mare pulled herself together and leaped. Higher and higher she rose, while I held my breath in suspense, and in another instant we landed on the other side - saved! When I looked round the grass on the spot we had just left was already burning. It was dark before we reached our camp; the skin of my neck and back smarted terribly, and as I pulled off my shirt the back of it fell to pieces, so intense had been the heat. After we left this camp, a few hours' ride took us across a portion of the State of Ecuador and landed us in Peru. Following the Rio Napo, we soon saw the Amazon, or, as they call it here, the Rio Maranon, before us. Finding it impossible to ford or swim the mighty stream at this point, we pitched our tent for the night. Next morning saw us approaching the city of Omaguas, and here we procured a raft to cross over to the other side of the river. Here, again, nothing but llanos lay before us, with grass as far as the eye could see. We were beginning to get tired of these endless plains, but, knowing that about three hundred miles to the southward we should find mountains, the "Andes Conomamas," we gave our horses their heads, and four days later our camp was pitched on the bank of the River Maquia, with the mountains in front of us. A hacienda was the only habitation we passed after we left the Maranon, and of our fellow-men we met only one specimen - and he made my two Mexicans long to kill him. He came from Brazil, on the other side of the Rio Javari, he told us, and begged our permission to travel with us as far as the mountains, as he was bound for Lake Ucayali. Of course, we allowed him to share our camp-fire, but had reason to regret our hospitality very much next day. How he managed it we could not find out, but during the night he disappeared, and with him our best mule and a big bale of our finest jaguar skins. His tracks led us to the Conomamas, where we lost them - which was a very good thing for him. This first experience in Peru did not impress us very favourably, but the next night was worse. Without warning the report of a rifle startled us, and a bullet whizzed past my ear. Weapons in hand, we jumped to our feet. We heard the sound of a horse galloping away, but this soon ceased, and although we started immediately in pursuit we could not catch the villain. In the countries we had hitherto travelled through the people were friendly to us, but here in the land of the "Children of the Sun" somebody had not only robbed us, but was trying hard to murder us also. We did not relish the idea of being shot in cold blood, and accordingly decided to move on. Although it would not be light for some hours yet, we packed our horses and set off, nor did we draw rein until a good forty miles separated us from the unpleasant neighbourhood of our late camp. Journeying always at the foot of the range, we met with no further adventure for some time, except that one day I lit upon an ancient treasure. I had been hunting guanacos and had followed a wounded animal into a sort of a cave, where I dispatched it. While skinning it I noticed an old hide bag near by, which I at once examined, and found it to contain a large head-band of gold, beautifully engraved with signs, of which I could make out only three - a man, a sun, and a four-footed animal. There were also three armlets, gold, but plain, and sixteen gold flowers on gold stems, exquisitely wrought of soft gold wire. The whole lot may have weighed, perhaps, from two and a half to three pounds, and was carefully stored away in our packs. One night soon afterwards I overheard a conversation between my two Mexicans. "To-morrow it will be just one year since we set out on this extraordinary shooting trip," said Pedro, in an undertone, "and I am slowly but surely getting tired of it. My old mother, too; she won't be in need, but four-and-eighty is a rare old age, and she has nobody to take care of her. How I wish our master would make an end of it!" "You are right," replied José; "but, amigo, what can we do? When we made our arrangement with el señor we said we would not mind if our journey lasted years, or if it carried us down as far as Tierra del Fuego!" "True," came the answer; "we can do nothing but wait and go on." After this they both relapsed into a gloomy silence. I made no remark, but their loyalty touched me and set me thinking. In the morning I told my two comrades, as though struck by a sudden idea, that if they liked we would strike to the westward and end our journey at the first port we should come to. They exchanged a significant glance; they clearly divined that I must have overheard their conversation on the previous night. Pedro promptly averred that he would infinitely prefer to go on, and José backed him up, explaining that only now would the real danger of our trip begin, as we should soon be in "El Gran Chaco," a region as yet untraversed by white men, where Heaven only knew what wonders we should meet in the vast primeval forests. I, of course, was only too easily persuaded to go ahead, for it had become my intense wish to penetrate into this unknown region and to see what none had seen before. Moreover, I was very young, and never thought twice about the danger or the hardships that inevitably awaited us. After much discussion, therefore, we decided to push through the north of Bolivia until we had the mysterious Gran Chaco before us, and then try to force our way through to Santa Fé de Rosario or Buenos Ayres. As the Conomamas here turned due east, we crossed them, following a spur trending due south. Not before we reached Mostenos, a poor village of probably a hundred and fifty Indian inhabitants, on the Rio Beni, did we know ourselves to be in Bolivia. Our course was east-south-east now for some time, and for the next ten days we encountered no habitation, when we saw the lights of the settlement of Buena Vista. Not long afterwards we passed a small town - Santa Cruz de la Sierra, if I remember rightly - little dreaming that this was the last sign of civilization we should see for seven long months, a period of unspeakable toil and privation. Our way led through dense and almost impenetrable forest, and we thanked our stars again and again that we had made the acquaintance of the old Indian hunter, for very often it was weeks before we came to a river or creek, and our knowledge of the water-carrying lianas saved us from a cruel death by thirst. Our supply of hard bread ran short, while for many weeks our horses had to feed on leaves. Game, of course, was plentiful, but often enough we could not make a fire for setting the forest alight, which would have meant death for us. On those days we had to eat the meat raw. To make it at least a little more tender we used to envelop it in the skin and put it underneath a saddle. [Note: the nomadic Tatar people of Central Asia were supposed to have done the same thing - hence Steak Tartare.] Two of us on foot cut a way through the branches and creepers with our "machetes," while the third generally rode, and, what with the weight and the motion of the horse, the meat lost much of its toughness. The heat was terrible, and we suffered cruelly from it, as well as from various insect pests. Some weeks after we left the last village behind us, we came to a lake of at least twenty square miles in extent, connected by a narrow channel with a second lake. The water of both was dark green near the shore, and farther out were curious black patches, which I took for a sign of great depth. What surprised me most was that these lakes were entirely void of life, either animal or vegetable. I can only account for it by the curious, but not disagreeable, taste of the water, due to a strong solution of some kind of mineral unknown to me. The grass about the shore was very dark in colour, and had a peculiar steely sheen; it seemed to be very rich, and our horses, after feeding on leaves for so long a time, liked it very well. One thing, however, puzzled me. Ever since we had come to the swampy region of the Rio Magdalena we had taken to the habit of mixing a small dose of quinine with every glass of water we drank to prevent the dreaded intermittent fever, but with the water of the lakes it produced an abnormally bitter taste which would stay for hours; and José, who, on account of his having had the "Yellow Jack" already, took a greater quantity of quinine, invariably had the colic after each drink. It was here that I again became indebted to my gallant little mare for saving my life - for the second time. One morning - it was my turn that day to watch camp - I was bathing quite happily in the cool waters and struck out for the middle of the lake, wishing to examine the dark spots I had noticed from the shore. I was quite close to one of them, when a strange feeling came over me. My head grew dizzy, and the next moment violent cramp seized me in both feet. I turned directly, but with every stroke I felt more and more exhausted, with a sensation as if an ever-increasing weight was pulling me down, and I became thoroughly frightened. I shouted for help, but in vain, for my companions were, for all I knew, miles away. I had nearly given up all hope of rescue, when, fortunately for myself, I remembered Pepita. Working hard to keep my head above water, I whistled on my fingers, and presently I heard the gallop of a horse - my mare. Soon my little darling came racing down, but stopped short at the edge of the water. Another whistle, and - thank God! - she saw me. With a loud neigh (to me it seemed the sweetest music I had ever heard) she reared, and the next moment the water closed over her. It did not take her long to reach me, when I caught hold of her long mane, and turning her we were soon once more on terra firma. When, after the termination of our journey, I made a present of Pepita to Pedro, he said it was the greatest token of friendship I could have given him. He was right: parting from her made me weep like a woman for the first time in my life. About a fortnight after we had bidden adieu to the lakes we became conscious of being followed by somebody or something. We caught a glimpse now and then of an ugly face peering at us, sometimes from amongst the underwood, sometimes from the lianas aloft. Before we could make out whether it was man, monkey, or what, it was gone again. I took it for granted that these distorted, wrinkled faces belonged either to some aboriginal natives or to an unknown species of monkey; but a few days later the mystery was solved in startling fashion. One afternoon - we were toiling hard again, cutting our way literally foot by foot - we suddenly heard an angry roar and a succession of terrible shrieks. The noises sounded very close to our left, and we accordingly forced our way in that direction. Presently, without warning, Pedro's rifle was pushed forward over my shoulder, and the next instant he fired. The report was followed by a stifled growl, and then those awful shrieks rang out once more. A moment later we broke through the undergrowth into a little opening. Here we saw, with his head towards us, a beautifully spotted tiger, resting at full length on a human body, his right paw pinning to the ground a second man. The brute was stone dead - my companion's bullet had gone straight to its heart. One man appeared to be dead; the other ceased his cries when he saw us, and as I approached him his small, glittering black eyes looked into my face with more awe, perhaps, than when they regarded the crouching tiger. Cutting the dead animal's sinews with my knife, I opened its paw and liberated the poor fellow. He tried to jump to his feet and run away, but was so weak from loss of blood, that with a groan he sank back again, with an expression at once terrified and appealing in his eyes. Carrying him to a small rivulet, which flowed through the opening, I washed the ghastly wound and dressed it with arnica. Overcome by pain and weakness, his eyes closed, but not before he had looked up into my face like a faithful dog. We dug a hole and buried the other little man, whose neck was broken. He was about four feet ten inches in height, with a broad chest and muscular arms, which were very long in proportion to his stature. His forehead was low; the nose shot straight out at an angle of about sixty-five to seventy degrees, and the eyes were small, black, and very bright. His whole body was covered with a thick, oily substance, which had a strong smell and most likely served to keep off the various forest insects; his short hair was black, straight, and very stiff; the rest of his body was hairless. His garment was the air and his weapon a short club of yellow wood with dark knots, very hard and polished. My patient slept for some time, while I frequently changed the wet compress I used to cool his wound, and he only awoke just before dark, when José shot a turkey. He never moved, but his eyes followed me wherever I went. I gave him some of the roast turkey later on, of which he ate a little; but when he tasted the weak grog I offered him the expression on his face was a study - clearly revealing to me the fact that these aborigines had certainly never came into contact with alcohol before. However, when he saw me drink of the same stuff, he emptied his small cup without hesitation. Of course, he did not understand what I said, but perfectly comprehended my signs. At night I covered him with a blanket, and bidding my comrades renew the compress from time to time, I turned in. All was quiet during the night; Pedro, who called me at 4 a.m., reported that my patient had slept well, but added that during the last half of his watch he had heard a continuous rustle in the branches of a big tree near the brook. He pointed the tree out to me and then went to sleep. I looked at my charge, found him quiet and without fever, and after putting a fresh wet towel on his shoulder, prepared my breakfast. This eaten, I went a little farther up the creek, where it was deeper, and bathed. The fire shone very brightly, so that I could overlook the whole camp. Suddenly I heard a rustling in the tree Pedro had shown me, and then a barking noise assailed my ears. It was as if a pack of terriers were angrily disputing together. I jumped out of my bath, gripped my rifle, and, no witnesses being present, cautiously advanced in the costume I started life in. Creeping noiselessly nearer to discover whence the sounds proceeded, a strange scene met my eyes. About forty of the aborigines, all of them under five feet in height, had torn the blanket from my patient and were hopping round him, gesticulating wildly and making the noise already described. A tailor would have died of starvation amongst these good people, for none of them, male or female, wore any more garments than myself at that moment. Meanwhile my patient appeared to be answering questions. In my eagerness to get a better view of the funny little people, I moved too quickly, a dry branch crackled underfoot, and lo! they vanished in the twinkling of an eye amongst the branches of the tree, climbing like monkeys. Afterwards, as they gained confidence in us, they kept dropping down to see their friend whenever the camp was quiet. In order to learn something of their customs I let my Mexicans go hunting, I myself staying at home and hiding, so that I could watch proceedings. I could not learn much, however. Their language - if one can call their barking utterances by that name - consisted of scarcely more than five or six sounds. Religion they apparently had none, and their principles were communistic. I never saw any trace of the existence of separate families amongst them, the children taking care of themselves, and neither women nor men troubling about them. A few days later I climbed the tree under the guidance of my late patient, who until then had not left camp. The habitation of the tribe was in the tree, and consisted simply of branches laid over one another and covered with a deep layer of moss; overhead they were sheltered by the leafy canopy from sun or rain. There seemed to be no sickness amongst them - at least, I never saw any, but some had terrible scars all over their bodies, evidently caused by wild animals. About a fortnight later we left the place, and I was much surprised on finding that my late patient, who was quite well by this time, followed us. I waved my hand in the direction of his home, but he only shook his head. He did us good service while he remained with us, for he acted as our guide and saved us much hard work in forcing our way through the dense forest. Nineteen days later we were out of the forest once more, a seemingly endless plain stretching away in front of us as far as the eyes could reach. We stayed two days on the border to enable us to prepare some "charqui" (sun-dried meat), and cut a whole mule-load of the water lianas in case we should find no water in the llanos. On the third morning before sunrise we gave our horses their heads (I had my strange aboriginal friend mounted behind me) and indulged in the luxury of a very fast spin over the grasslands. My little native wound his long, muscular arms around my middle and held on for dear life, groaning all the time; he had never ridden or seen a horse before. An hour later, when we pulled up our steeds, the little chap slid off my horse, and, giving me a look of infinite gratitude and sorrow, turned and ran off towards the woods as fast as ever he could, and that was the last we saw of him. We halted for a short rest in the afternoon, but had not even kindled our fire when we heard the gallop of many animals. Expecting them to be a herd of wild horses we made ready for the chase, but as soon as we were in our saddles we noticed that the horses were not riderless, but mounted by long-limbed, bony Indians, carrying bows and arrows. The next moment Pedro's horse neighed loudly, and we were seen. With a wild whoop the savages wheeled their horses and rushed down upon us. Not wishing to take human life without urgent necessity, we shot four horses, bringing the riders down with them. This brought the crowd to a standstill, and they surged round the fallen horses, screaming and shouting with amazement and rage. It seemed to me that they were not acquainted with firearms. Their courage, however, was dauntless, for presently they mounted again and charged once more. When about a hundred yards away they gave a terrible howl and discharged a shower of arrows, which fell a few yards short of us. This time it was obvious that they meant business, and we bestirred ourselves to give them a warm reception. Our rifles rang out in quick succession, and savage after savage rolled on the ground. Again they halted, and another shower of arrows came whizzing through the air - this time, fortunately, too high. We did not allow them to repeat this dangerous performance a third time, but handed out some more lead, and five Indians and two horses fell. This was evidently more than they could stomach. Like a whirlwind their horses flew round, and they did not halt until about three hundred yards lay between us. Wishing to show them that our rifles could punish them even at that distance too, we took a careful aim, and three more riders lost their mounts. After this last exhibition they went off at full gallop, and we never saw them again. The llanos, after all, were not so extensive as we thought at first, for on the eve of the fifth day we noticed a dark band stretch across the plain on our horizon, and we knew that more hard work was in store for us. Two days later we reached the forest. We toiled on day after day, suffering terribly from the heat and venomous insects. The undergrowth was so dense that we could not even hunt; we had to feed on birds, which fortunately, were plentiful. But even of these we were deprived for three days. One night the air became almost suffocatingly oppressive, and to our horror shortly afterwards we saw thin swaths of smoke gliding through the tops of the trees. We could smell burning wood, and suddenly realized to our intense horror that somewhere to the westward a forest fire was raging. We used our machetes in the effort to escape, but half an hour later threw them down in despair - we had made exactly three yards headway in the time! Our work was useless. If the fire was not kept away from us by some power stronger than our own we knew we were doomed. We therefore arranged that before the fire reached us we would aim at each other's heads and blow our brains out rather than be burnt alive. The fire must have been some distance away, as we could not see any glare from it. Our one hope was that it might be stayed in its awful progress by a broad stream. All the birds, monkeys, and other animals fled, and our horses were mad with fear. This terrible suspense lasted for two days, but on the evening of the second day the forest seemed much as usual, although there was no living thing near us. Our supply of charqui was finished, and we had to depend for each meal on what we could bring down. In the forest the heat was so terrific (one hundred and thirty degrees Fahrenheit in the shade was the usual temperature, as registered by my thermometer) that four hours after an animal was killed the flesh would become putrid. During the three days we could shoot nothing we were compelled to kill one of our mules for food. To cut a long story short, it was two months after we left the plains before we heard the gurgling of running water, and were checked in our southward course by a mighty stream, which later on we learned to be the Rio Pilcomayo, in the Argentine. The banks were crowded with alligators, of which we shot forty-three on the first day, so that we could not even try to swim it. It flowed almost due north at this point; we therefore decided to travel up-stream, as nothing would have induced us to go back again into the awful wilderness we had just left. It would have been better for us had we followed the current, as the river wound hither and thither in a most bewildering way, and we encountered a perfect network of tributary waterways which gave us no end of trouble and difficulty before we got clear of them. By this time we were getting heartily sick of the whole business; the work was altogether too trying and monotonous. The only redeeming feature was that game was plentiful. We had followed the river for about forty days, when, one day, we noticed a continuous noise, something like the roll of very distant thunder. As we proceeded on our journey it grew constantly louder, but another mile or so solved the riddle. The river, which we had steadily followed up-stream, here ceased, and dry land appeared. We found that the stream at this point emerged from a subterranean passage into a huge basin about a hundred and ten yards in breadth, where the water boiled furiously, foaming and swirling round and round, until it overflowed and formed the over-ground course of the river. Twelve days later saw us on the bank of another, the Rio Bermejo, not so broad as the Pilcomayo, but still too broad to swim. Not being able to cross, we went down-stream this time, with lighter hearts, for we noticed unmistakable signs of our approach to civilization. A few days more and a monotonous chant struck our ears. Presently a barge rounded a bend of the river, paddled by eight Indians and captained by a rascally-looking Spanish half-breed. At first sight of us they were inclined to cross to the other side, but Pedro peremptorily hailed them in Spanish and raised his rifle significantly. This gentle hint had the desire effect, and they hesitatingly approached us. Upon inquiry the half-breed informed us that, if we crossed to the other side and followed the Bermejo, we would in the course of about nine days arrive at its junction with the Rio Parana. Following the latter for a few hours would bring us opposite the city of Corrientes. Only ten more days and our troubles would be ended. The yellow-skinned rascal, however, had not told us the truth, and, as it turned out, instead of ten days it was two-and-twenty before we saw the white houses of Corrientes. We arranged with our informant to ferry us across for twenty U.S. dollars, but before the bargain was struck, Pedro had half an hour's animated conversation with him. Two hours was the time the bargemen took to carry us over, landing us nearly a mile farther down-river. During the passage the half-breed gentleman became very much interested in the leather bag in which I kept my cash, the coins I had collected of each of the twelve Republics we had traversed, and my little Peruvian treasure, but a friendly poke from me in his ribs, which nearly sent him flying overboard, told him in plain Western language that his curiosity was out of place. Ere dark we fell in with a tribe of Indians (Guaranis of Paraguay), and I was promptly asked by their chief if I could not let him have some "aguadiente" for "his little sick child." This question assured me that these Indians were not ignorant savages like those we had met in the Llanos de Chaco, but were "civilized." All the same his request for spirits was equally promptly refused, for by his looks I gathered that "the little sick child" concerning whom he was so solicitous was none other than himself. For five silver dollars these Indians showed us the way down to Corrientes, and so, at last, we regained civilization once more. That very same night, as though to mark the occasion, my watch, one by a good London maker, which had cost me twenty-five pounds and kept splendid time throughout the journey, was stolen. My record hunting and exploring trip was at an end, and none of us were sorry. In spite of the indescribable sufferings and privations we underwent, however, the ride had its pleasures, and the memory of it I shall never forget. The Long Riders' Guild can find very little information about the author. We know only that he died of heart disease in 1912 in an hotel in San Francisco, in his fiftieth year. Whereas we believe Rose made the journey, because it appears to be vouched for by Long Rider Roger Pocock, some of the episodes described do seem somewhat far-fetched!